Join the discussion on our forums! Come discuss Lunar Visions over in our dedicated Lunar Visions discussion topic. The true mystery of lunar visions is how there is nothing to watch when there are so many channels. This card is good. I mean, if they nerf Nourish to 7 mana, everybody will start using this. Don't get me wrong. This is a good card. Problem is, why should I play this over Nourish? Sure this card gets you discounts for drawn minions, but Nourish gets you three cards, and can be comboed with Fandral for extra mana usage in things like Jade Golem decks. I am testing it with a Wild Ramp Druid deck, and so far I really like Lunar Visions so far. Because you can get minions on the board faster, and sometimes it can help with a bad starting (ramp) hand. I do agree with what you are saying comparing it to Nourish, but I can see Lunar Visions helping "speed" up some Jade Golem decks too. I might test the card with my Jade Druid decks as well. I tried this for fun in old school Ramp Druid. Its actually really good in that deck. You're ramping the first few turns as usual, then you play this on turn 5, allowing you to play a 8 drop and 9 drop on turn 6 and 7, then naturally curve into your 8 and 9 drops. That's effectively dropping 8+ minions on turn 6 onwards (< turn 6 for your opponent if you've been ramping the early turns), which is waaay faster than Jade Golem decks. Unlike Nourish, this card gives you both Ramp AND card advantage. The only downside is you either cannot run most of the really powerful Druid spells, or you risk reducing the consistency of this card. You can use nourish for ramp, or nourish for draw and it doesn't have anti-synergy with spells. And from my experience using even the most optimised Call Pet decks it might as well say draw 2 spells. That's my point, with Nourish you have to pick between ramp or draw (unless Fandral Staghelm miraculously sticks). The anti-synergy with spells is why Lunar Visions won't fit into the current meta Druid decks, which I think is a good thing because those decks are already really strong. Instead I think it may revive the old Ramp Druid archetype (I'm probably wrong, because most Hearthstone players hate experimenting and only want to netdeck Tier 1 decks). Also I think Lunar Visions is a lot more viable than Call Pet because it is a lot less restrictive. To fully benefit from the discount, you should be running minions that cost at least as much as the discount. That means to fully utilize Call Pet, your curve needs to start from 4, and the Hunter hero power has less board control than Druid. Also, there are not many Beasts with proactive board control effects, especially high cost ones, which means without Spells you'll have no way to comeback from behind. 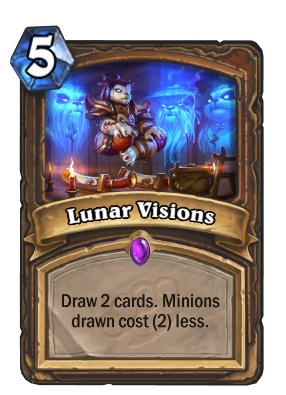 Lunar Visions on the other hand allows you to run minions such as Ragnaros the Firelord, Baron Geddon, North Sea Kraken, Cenarius, Deathwing for board control, or gigantic Taunts to stall. But also it gives indirect ramp. Ofc when you draw a 8 Drop like Ragnaros the Firelord or even Gruul evenso i know he isnt played its huge tempo. In Terms of Combo Decks it might also enable earlier or higher OTKs or more Value out of combos. The downside on this card is the random element. In a balanced deck you have also spells witch wont be effected by the indirect ramp. On the other hand i think only hitting one minion is enougth depending on the minion ofc. My overall opinion: Ramp Druid Card Draw. But wont exchange nourish cause of more potentiel from it. So it likly wont see play in standart. But solid pick in arena. Just meh, can get value, but can be pretty hard to get it, I remember making a similar card, but it effected spells only and minions by another form. Potentialy can be a better Nourish, however the chances are pretty low to get its value, Druids commonly don´t tend to bring a lot of minions unless if it is Beast Druid. First off: This card will probably reduce cards by a net 3 mana at best. You won't always draw 2 minions, as if you're a druid running this card, there's going to be the duplicate, as well as some basic druid spells to catch up on board. Thus, the card can be considered 2 mana: draw 2 cards, can only be played at or after turn 5. Thus, I think it will be used, but it won't be terribly popular. Druid seems to be getting a lot of combo cards, they're making up for killing the old savage roar combo XD. It is as playable as Far Sight, Call Pet, and Thistle Tea. 1. far sight is bad bc you cycle only one card and the sweet spot is small. you ether waste mana or you didnt do anything in your turn. 2. call pet is crap bc you need to draw a good beast with 3 and 4 mana. (infested wolf, grub, camel) also most of the tempocards with beastsyn are spells or bad on there own. 3. tea is to expensive and you cant dig for a specivic card you need. tracking/discover and copy for 6 mana would be playable. Far sight is actually pretty good even if you draw a card that's worth 2 mana, immediate draw of a card is worth 1.5 mana usually rounded up. far sight is fine but shaman has better cards and lack at good combos, so its useless. mage/druid/rogue would love far sight.